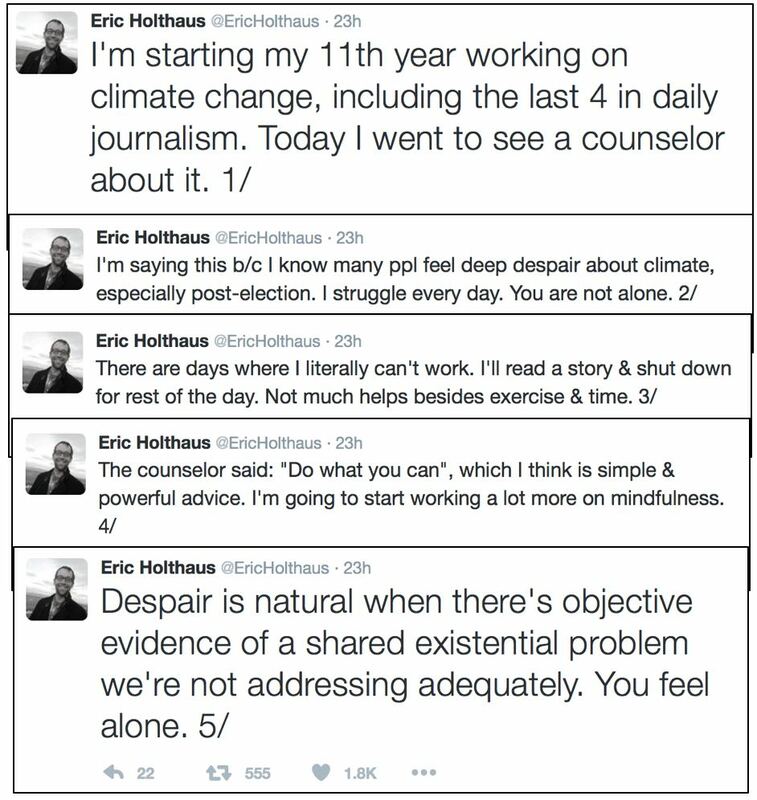 Meteorologist Eric Holthaus, who has appeared a couple of times on these pages in the past (more on that shortly), is in therapy. Well, okay, lots of people are. 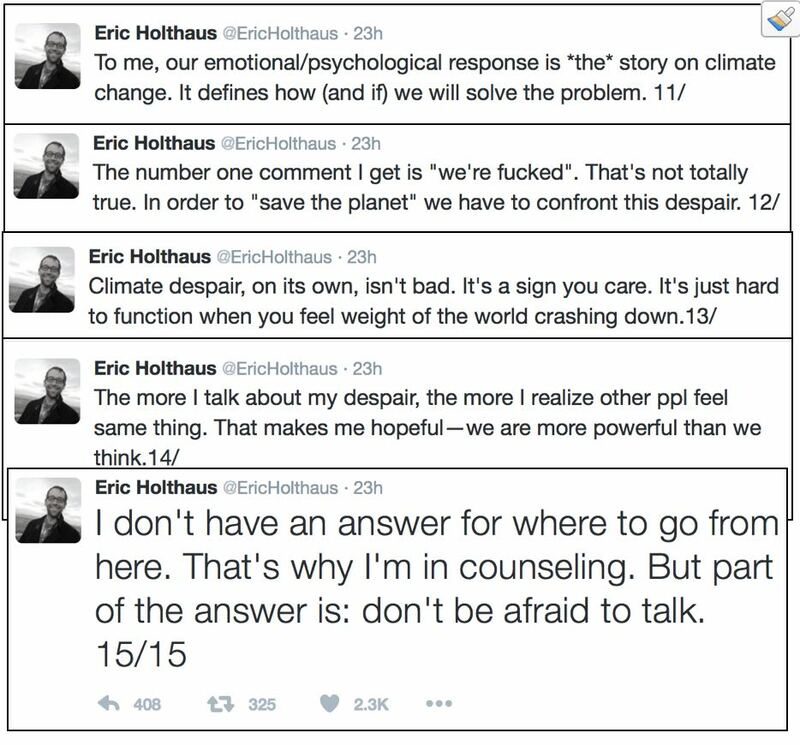 But get a load of what has driven Holthaus into therapy: "I know many ppl feel deep despair about climate, especially post-election." And it's because of this, "There are days where I literally can't work," and "We don't deserve this planet." In 2013, reacting to the latest report from the global warming alarmists at the Intergovernmental Governmental Panel on Climate Change, Holthaus reported that he "broke down in tears" when he boarded a fossil fuel-burning commercial flight and said he was "committing right now to stop flying." Oh, and "I'm thinking of having a vasectomy." Holthaus later backed away from that final item, perhaps after a talk with Mrs. Holthaus. In 2014, while at Slate (but of course), Holthaus asked, "Could there be a connection between climate change and the emerging conflict in Iraq?" Naturally, the answer was "a qualified yes." This is what happens when a bogus "scientific consensus" which doesn't genuinely exist becomes accepted as the only possible wisdom. Dude, have a talk with Judith Curry and Anthony Watts, will ya? As to the Great Barrier Reef, Holthaus somehow missed this little bit of news: "Scientists Proven Wrong? Great Barrier Reef Found Relatively Unaffected By Global Warming." Specifically, "(the Reef) is tremendous condition, most of it is pristine, the rest is in full recovery. It shows the resilience of the reef." As to Tweet 10, educate yourself, man. Don't swallow the globaloney from the self-interested gloom-and-doom community. Did you know that James Hansen said we had only four years "to save the earth" -- in 2009? But here we still are. I know you're not going to like this, Eric. But "where we go from here" is "Don't worry, be happy." This bogus construct known as "climate change," or "global warming," or whatever is not going to doom the earth, especially because what appears to be the best evidence tells us that the global warming hiatus, completely unexplained by the warmists' sacred computer models, is in its 20th year — or at the very least lasted an "unexpected" 19 years. 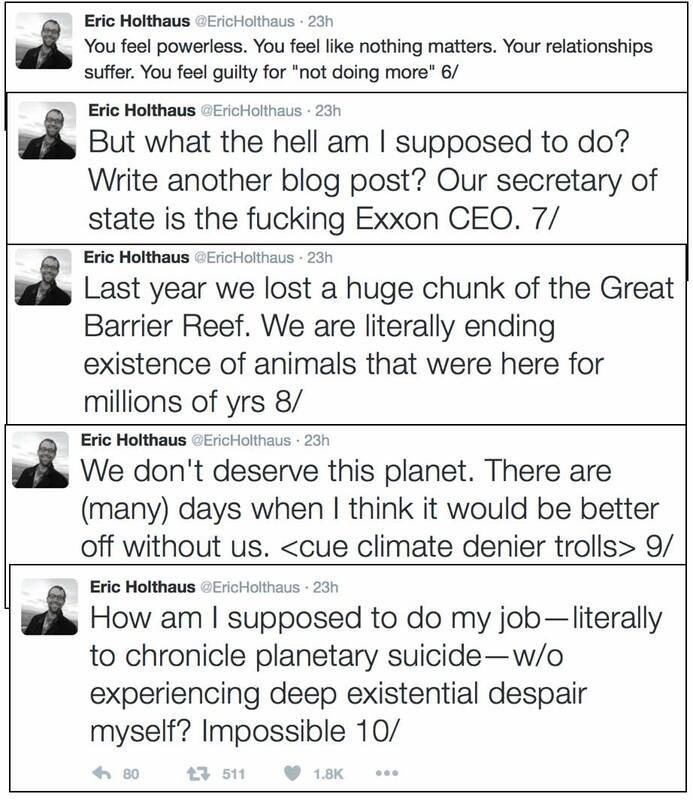 What Holthaus's latest meltdown foretells is a long line of elementary, high school and college-aged kids who have closed their minds and have been conditioned to adhere to the globaloney gospel regardless of the facts — and along with it, the belief that the world must stop using fossil fuels (impossible, and unnecessary in any event), and the further belief that only an end to commerce as the world has known it, and control of everyone's everyday actions by a worldwide entity, can save us. So I don't laugh at Holthaus. Instead, pity him, and others who have been similarly brainwashed, apparently beyond redemption. And reserve a healthy amount of fear for the possibility that a critical mass of people like him who have abandoned critical thinking will ruin everything for everyone — and condemn much of the world which has a chance to emerge from poverty to eternal misery.